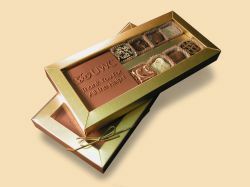 the perfect corporate gift, delicious pralines combined with a custom made chocolate bar featuring your personalised message or company logo, all packed in a luxury presentation box with clear sleeve. 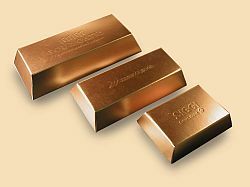 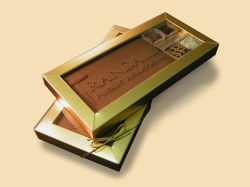 impress your clients with this unique gift, a personalised ‘gold’ bar made from delicious belgian chocolate. 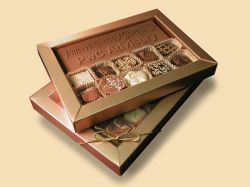 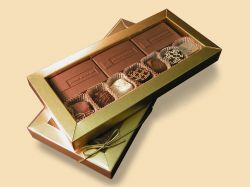 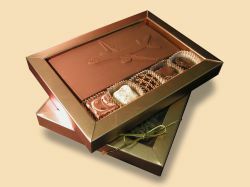 box can be supplied in gold or silver and shallow embossed with a small message or logo at no extra cost.